You are here: Home > What Happens When the Queen Burps? 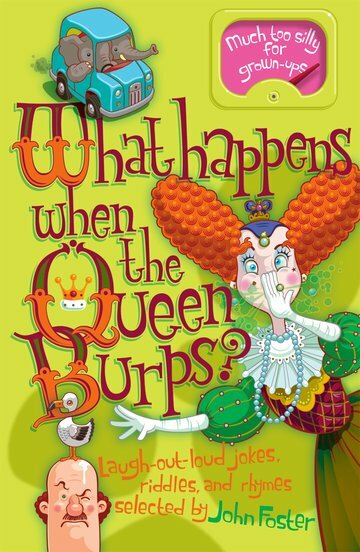 What Happens When the Queen Burps? is a hilarious concoction of jokes, riddles, and rhymes compiled by the master of witty verse, John Foster. Warning! Contains wizards, giants, werewolves, escaped convicts, and some very nasty smells! More than just a joke book. Features rhymes, riddles, tongue-twisters, and much more besides. This fabulously funny collection is guaranteed to keep children amused for hours. Part of a series of 4 books of jokes, riddles, and rhymes compiled by John Foster. Over 1.5 million copies of John Foster's books have been sold to date. Fully illustrated throughout with black and white line artwork. Previous title: Cockadoodle Moo (9780192731845).